Thought I'd kill two birds with one stone again, I loved the monocromatic dare from DCM, but was a bit stuck for a layout, so decided to use the latest Di Hickman sketch, very useful! 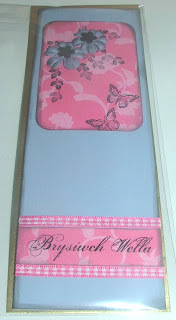 I was very good, sticking very closely to the stict one colour scheme, I even managed to cover up the silver coloured staples! Do I get extra points girls? 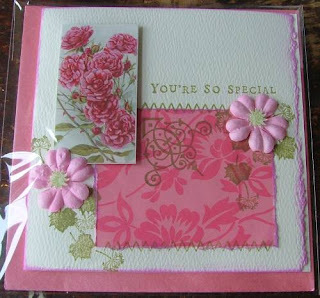 Ingredients: Anna Griffin papers and stamps, Label punchies, organza and satin ribbon, staples and Fiskars scallop edged scissors. Having a busy blogging day today! 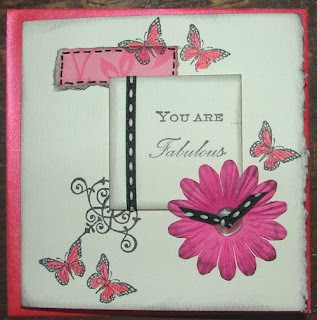 Had another go at the Wednesday Stamper challenge, it was to use colour on a stamped image. Going out of my comfort zone again I stamped an image and then coloured it in with my good old watercolour pencils then brushed over with water to paint it in.. 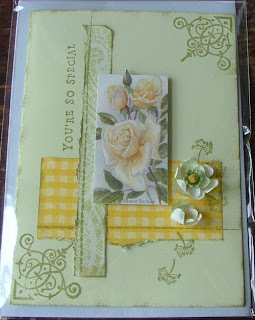 Ingredients: Anna Griffin stamps, Derwent water colour pencils, Fiskars wide scalloped scissors and some gems. Please check out one of dear friend's first ever blog. 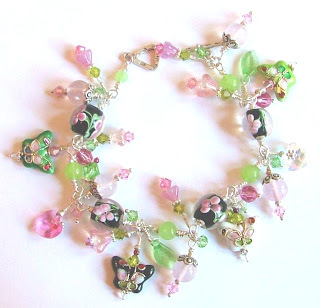 She makes gorgeous jewellery from semiprecious stones and sterling silver. 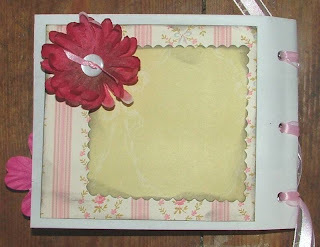 Just to give you a taster... click on pic to take you to her blog. ...just wanted to plug the lovely lady on ebay I got this stamp from. 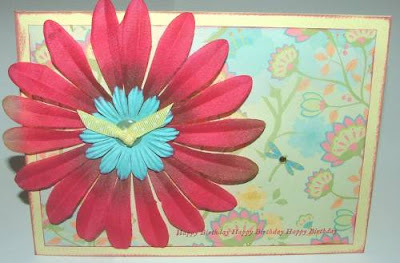 I use it to stamp the back of my cards so people can get in contact if they so wish. I ended up making two, the rectangle one out of the scraps from the square one. 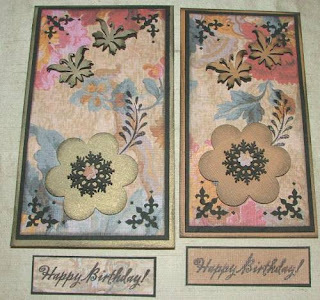 Ingredients: Paper from DCWV and HOTP, printed vellum, fabric flower, ric rac, brad, vintage button, funky fibre and butterfly punchies. ...using circle words and words printed on acetate. 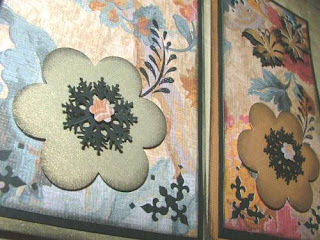 The acetate is then layered on a piece of parchment that has been ink distressed around the edges with BRILLIANCE Moonlit White. See below for printable freebie! Di Hickman sketch #6 and my first FREEBIE! I am loving the idea of these sketches, it just takes the pressure off figuring out if a card layout is balanced or looks good, because you can see from the sketch it is. 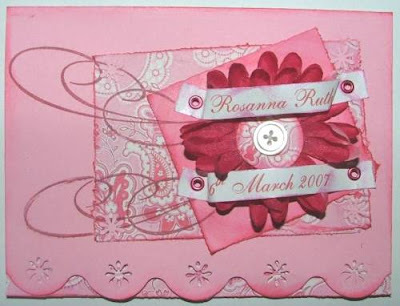 All you have to do is choose colours, papers and embellishments! FAB! 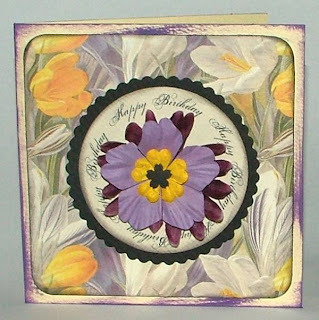 Ingredients: Anna Griffin paper, fabric flower and Primas and a punchie, Fiskars scallop edged scissors and Fiskars shape cutter for the circles. Words in circle Porcelain font (my fave at the moment!) - and see below! Offering my first freebie! 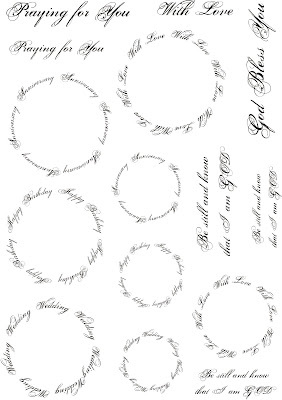 I had a play on Corel Draw this morning and came up with an A4 sheets of words in circles. 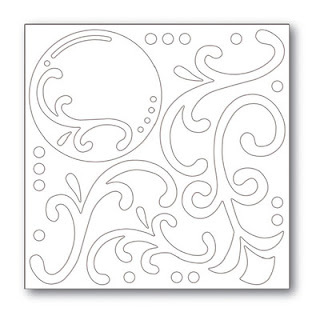 They are easily cut out if you have a Fiskars shape cutter circle template, if not I am sure you can improvise! 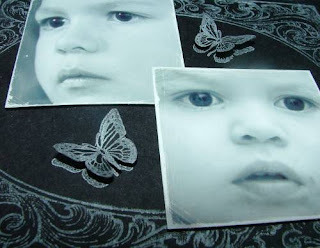 I have had a go printing on vellum and I am sure it would look great printed on acetate and used as an overlay. It is a jpeg format, if you click on the image to see it larger then left click and save the image on your computer that should work... please let me know if it doesn't and I can email it to you, please use for your private non commercial use. Please post your comments on here if you use it and have pics on your blog! Just finished this commissioned piece for a wedding. I think I'm more chuffed that I took the picture myself! This is my take on the recent challenge set by DCM. I kept my options open by going for gender neutral colours. 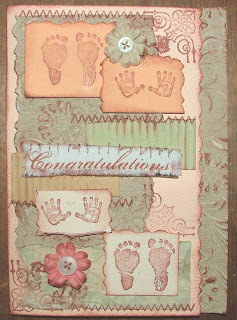 Ingredients: Textured paper from The Works, "Congratulations" printed on fabric, Prima flowers, vintage butttons, stamps from Clever Cut and Hero Arts, Fiskars colonial edged scissors. Had chance to make this for a 5th birthday present. Thought it would be something she'd appreciate in years to come. 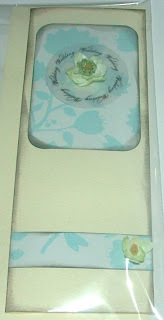 Ingredients: Anna Griffin paper, Prima flowers, All My Memries stickers, other flowers, vintage buttons, Hero Arts swirl stamp and Clever cut corner stamp. Had a go at the new challenge on Wednesday Stamper. I find eyes fascinating and have many many eye stamps in my collection. They say the eyes are the window to the soul. Let us SEE the creative way you incorporate eyes into your stamped pieces. 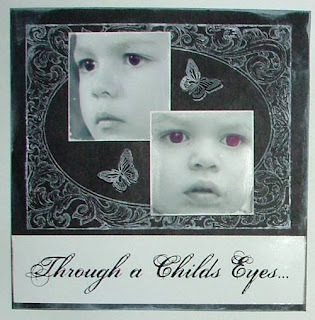 I don't have any "eye" stamps, so rather than buy something I may not use again I thought I'd use some lovely photos a friend had taken of the boys. 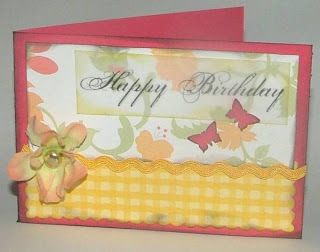 Also, I have to admit it's not a card, more a 6x6 layout. I have just put it in a special frame for layouts and it looks lovely. Tom just said, "is that for us? ", "why do you say that" I replied, and he said "because you usually give away what you make". Funnily I suppose that is true. Whenever I get chance to do layouts they're usually for a dear friend of mine, if I make a Paper Bag Album thats usually to sell or a commission and if I make a card, it's either for sale or to give someone! So, it's quite nice to keep this piece just for us! 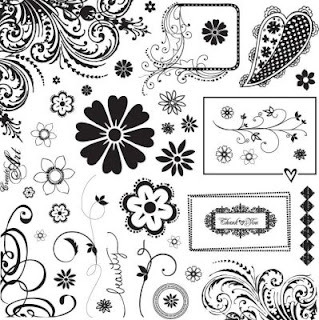 Ingredients: unknown origin frame stamp, Butterfly stamp by All Night Media and Porcelain font, Corel Draw 8 to make pictures black and white. Been looking at some lovely new stamps on the market. These are on sale at Paperarts... just scrummy! They're a 12x12 sheet. My youger sister Esther was involved in a Gospel Choir at the secondary school we all went to. At my wedding a few of the members came and sang during the signing of the registry. A website for the choir to keep in touch has been set up and there are some MP3's you can listen to online. One of the songs they sung was Spirit of the Living God, its a beautiful version. I really enjoy Stomp, which actually made it quite high on the US charts even though its a gospel song! And asong that makes me cry is You Don't Have to Worry. 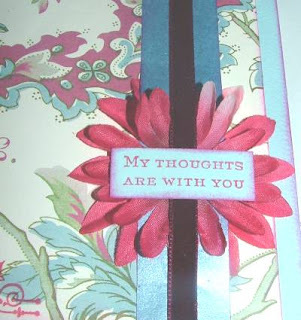 I've been meaning to create a card with one of Di's sketches, so I thought I would incorporate it with the recent challenge from DCM - a Get Well Soon card. The dark ribbon is actually a lovely wine colour, it hasn't come out to well in the photo. 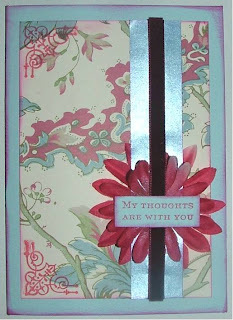 Ingredients: Anna Griffin paper and sentiment stamp, Clever cut corner stamp, blue lustred paper, fabric flower and velvet ribbon. This week���������s theme has everything to do with movies. Which movie or movie star moves you to tears, makes you laugh, scares you to death or drives you crazy? 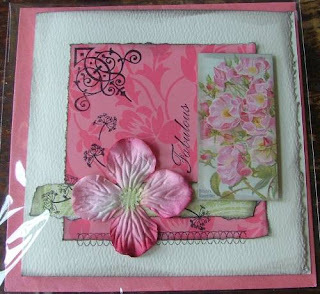 Ingredients: Anna Griffin stamp, Primas flowers, ribbon, vintage button, eyelets, crystals and a fabric flower from local shop. ...to all you mums and significant women in children's lives! It is such a privledge to be involved in the life of a child, and such a responsibility too! Praise God that we can have His help to do it. I got an "adapted" card thrust on my pillow this morning. Daddy apparantly couldn't find the blank card?! So he raided the stash of bought cards and got Luke to stick on some punched out shapes, Luke had signed the inside... I don't really think he understands what Mother's day is about! Tom had bought me a Breakfast at Tiffany's DVD, so looking forward to watching that sometime. 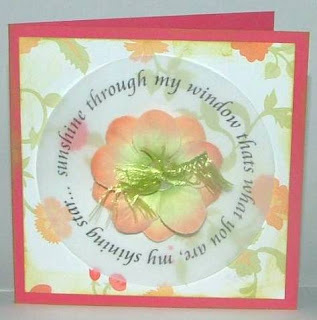 I've been thinking about creating and selling more Christian themed cards and others to sell through my online shop. To be honest it doesn't do loads of business as I haven't the time to promote and keep it stocked with the latest products. I'd also like to be actively involved in raising money for a charity I've got to know through my inlaws. It's called Morning Star, and it's basically a daycentre for children infected with HIV. After doing a little bit for Comic Relief, I'd prefer to know my money was going directly to a cause that I could be in touch with. Thank you everyone that bid on the Red Nose Day inspired kit... raised £12! 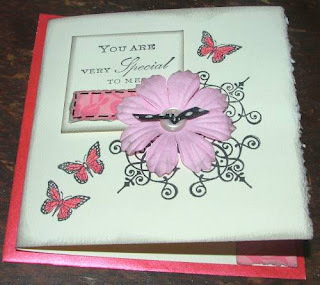 Ingredients: Papers from Anna Griffin, TLC and Colour Bok, fiskars large scalloped scissors, EK success flower punch, butterfly punch, Anna Griffin clear stamp, Rubber Stamp Tapestry leaf stamp and some jewels. And here is her card... very randomly based on a sketch from a blog... unfortunately I can't seem to remember where I got it from... if anyone recognises it please let me know, I'd love to link it. 3rd card of the day! I'm on a roll today! Had a lovely morning at the breast feeding suport group. Some of the girls had bought some homemade cakes and one of them had organised a quiz. Raised about ������20 - just doing our little bit! I wanted to play with these fabby flowers I got for a bargain. I have a friend who's birthday I totally forgot, so this is perfect. Please note the sweet little butterfly on the printed paper that just happened to be in the right place and was just crying out for a bit of bling! 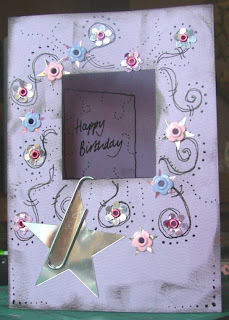 BTW the 2nd card of the day is going to someone special... she'll know who she is when she gets it. 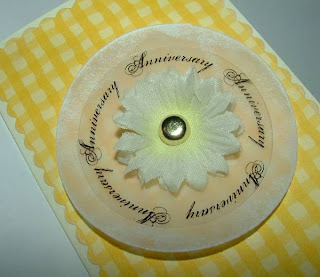 Ingredients: Flowers for local shop and Blooms to go, vintage button, DCWV floral stack paper, Do-crafts birthday stamp. Thought I'd get this posted before the next dare from DCM, but they've pipped me to the post... nevermind. Really enjoyed this one... some lovely friends of ours had a baby girl this morning, so it was a good excuse to make a card and use my new Fiskars scalloped scissors! Ingredients: anna Griffin and TLC papers, fabric flower from a local shop, eyelets, vintage button, stamp, Fiskars scallop scissors and very mini daisy punch. Fancy some extra stash and donating some money to Comic Relief? 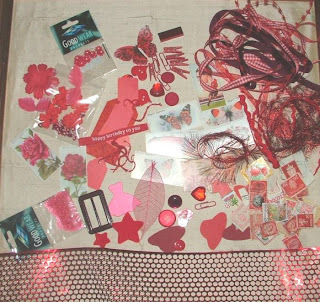 Click on the picture below and bid on this fab red kit, great for cardmaking, scrapbooking, altered art etc. Have fun! NB: ONE DAY ONLY! Ends just after 9.30pm GMT Friday 16th Feb. 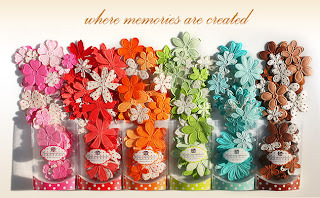 I've just had an email from Craft Obsessions anouncing the latest arrival of Primas from the US... they're gorgeous! Thought I'd better do this challenge from DCM as the midweek one has already gone out! 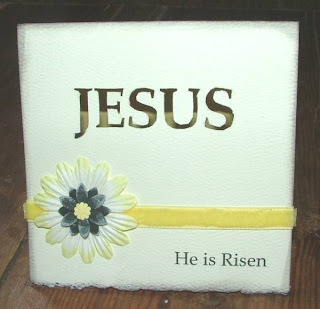 I've taken a slightly different spin on it, and gone for my "superhero" ... Jesus, and excuse to make an early Easter card. I was made to talk about him today when 2 ladies came to the door and asked what I thought about religion. I told them what I believed. I was partly inspired by one of Bety's recent creations where she used a colour behind an aperture. 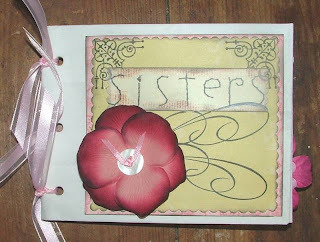 Ingredients: Font is Palladius, velvet ribbon, Flower from Blooms to Go and 2 other flower punches, and a numb finger from cutting! I've been getting on with my list of tiaras and wedding jewellery. Here is one for a friend getting married in May. Really enjoyed making this. 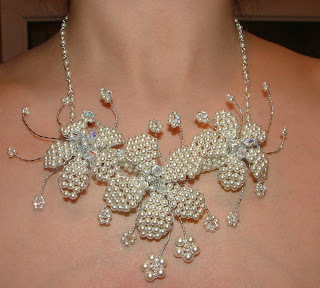 Ingredients: Foil covered wire, faux pearls and AB coated Swarovski crystal. Not yet got round to doing the latest challenge from DCM myself, but Luke has! He had some free stamps from a magazine his daddy had bought him. So I let him loose on my inks and this is what he did! 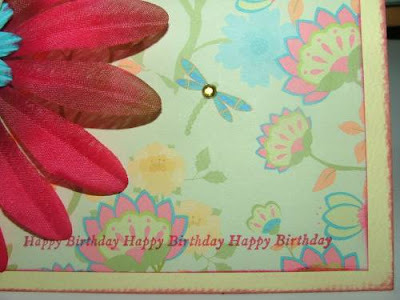 Ingredients: Cardstock by DCWV, butterfly and corner punch by Anna Griffin, snowflake punch by Xcut, small flower punch by Carl Craft, leaf stamp by Anitas, Happy Birthday stamp by Anna Griffin. 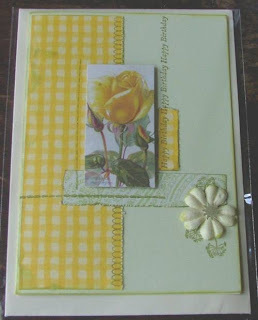 The latest midweek challenge from the Daring Card Makers! Thank you ladies, as I desperately needed inspiration for my nephew's birthday card! HAPPY BIRTHDAY TROY!!! I'll getthis in the post tomorrow! 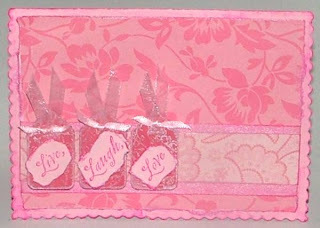 Ingredients: Papers by TLC, and others, Anna Griffin word and background stamp, Clever Cut corner stamp, QK star diecut, vintage buttons and some ribbon. I've made a start on one of the jewellery orders -yay! Going to have a play with the other one tonight. 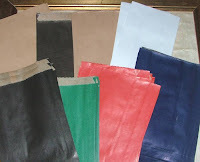 Have also got to prepare for tomorrow evenings jewellery class. HAVE GOT TO NOT PLAY WITH PAPER!!! 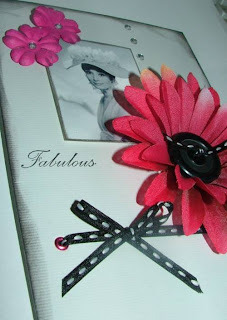 These and other chipboard pieces are now for sale in my shop, click on photo to link straight there! Can't wait to have a play! However, I have two jewellery orders to get on with! It's so not fair when the paper mojo has got me! 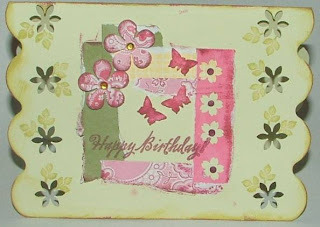 Had a lovely play with my new stamps and trying out different collage type layouts - a great way to use scraps! yay! Am totally loving the little Cow Parsley type stamp. It comes in a montage set similar to Rubber Stamp Tapestry, only they are clear, so I pop them onto the lids of Versamark ink cubes for easier application. I have recently been using my trusty metal ruler to tear in straight lines, its so much easier than cutting! 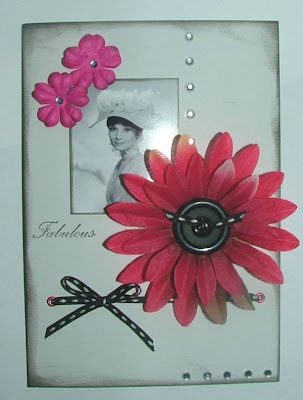 and looks great with the shabby collage look. 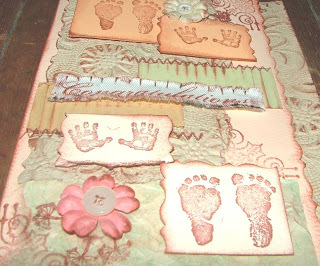 Ingredients: Stamps by Anna griffin, Clever Cut and Docrafts, papers by Anna Griffin and HOTP. 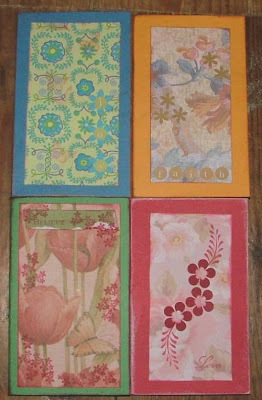 Flowers by Prima and others, vintage cigarette card repros. 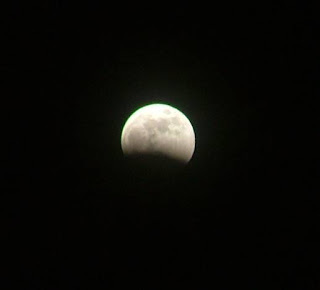 My well informed astronomy friend told me there was an eclipse of the moon last night. We had a fabulous view from the front of the house. 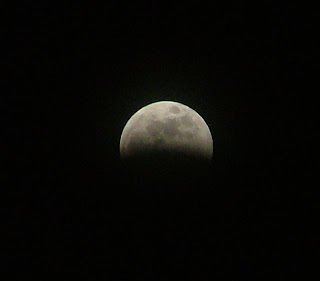 Took these pictures with come help from the same friend who is also very well informed about manual digital cameras! His help reminded me that I really should read the manual that came with my camera! 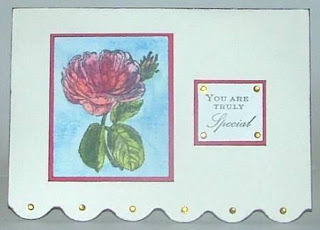 Made these cards too, I love my new blooms! 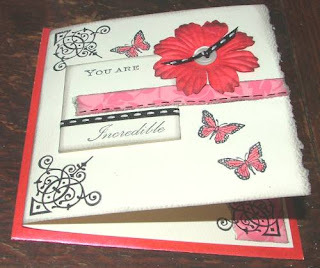 Ingredients: Anna Griffin paper and sentiments stamps, corner filigree stamp by Clever Cut. 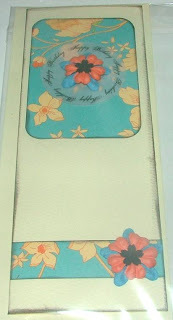 Butterfly stamp by Hero Arts, Flower by Blooms to G0. I've realised I was hard on myself for the last card makers dare. 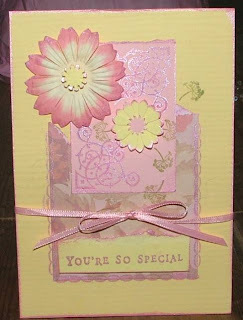 My DH also commented the ideal situation would be to have all those restrictions and still come out with a card I liked.